TUMC encourages a healthy and vigorous lay ministry. Our Lead Pastor preaches at about half of our Sunday services. Members of the team share the remaining Sundays, along with guest preachers. This gives our Lead Pastor a support system when developing sermons and time to be involved in other areas of church life. 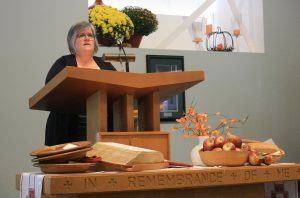 It also prompts congregation members to grow and share their own gifts of preaching. The Preaching Team gathers about every six weeks to plan for upcoming sermons, discerning congregational needs to develop themes and series. Feedback on recent sermons helps preachers affirm and challenge each other. The Preaching Team also examines the role of preaching in our congregation’s Christian education and nurture. TUMC’s Preaching Team is “discerned” rather than appointed. This means the congregation as a whole discerns who serves. The team has four or five members serving two-year terms (they can be chosen for another term), plus the pastors. Each member typically preaches twice during a year. Current members: Peter Haresnape, Jeff Taylor, Christina Reimer, Lori Unger, and pastor Michele Rae Rizoli.